The skirmish between Caley Thistle and Ross County players after Michael Gardyne and Brad McKay clashed. 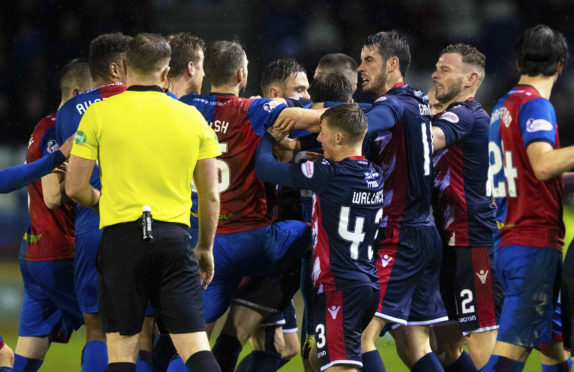 Ross County co-manager Stuart Kettlewell insists he will not try to quell the passion in the game after his club and Caley Thistle were yesterday fined by the SFA following the melee during the last Highland derby. Both sets of players became involved in spat following a tackle by Brad McKay of Inverness on County winger Michael Gardyne in the Scottish Cup replay on February 19 and were deemed to have breached disciplinary rule 204 as a result resulting in a £2,500 fine for each club. Kettlewell has fallen foul of the SFA already this season and has served a three-game touchline ban with three other matches suspended. He believes emotions naturally run high in the game due to the competitive nature of football and believes authorities will never be able to curtail it. “If we lose the competitive edge what will be left with? I’d love someone to tell me. Do we want players pushing and shoving each other on the pitch? No, but when you are dealing with certain flashpoints between competitive players there will be the odd stramash. Kettlewell added: “What people don’t see is when we went to Inverness last Thursday for a cup of tea with John Robertson and Scott Kellacher to talk about the pitch ahead of the derby which was postponed on Friday. “They don’t see the players at the two clubs passing other guys in town and going for a coffee with one another.It is 90 minutes of football. Caley Jags boss Robertson said: “We’ve said from day one, if the compliance officer is going to get caught up in things like this she is going to be a very busy lady. “It happens in virtually every game. “I was at a match as a spectator for the Hearts against Hibs game at Tynecastle and there three such incidents. They got pulled for one and no action was taken. “They were all worse than what happened in the derby. I don’t understand it. “The amount of warnings being issued to clubs is really getting beyond a joke. “The referee dealt with it.